Pictured are examples of three different tags. The small tag "monogram" is an example of a gold tag with gold beaded rim. 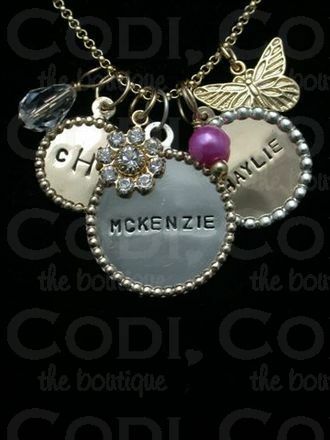 The medium tag "Haylie" is an example of a gold tag with silver beaded rim. The large tag "McKenzie" is an example of a silver tag with gold beaded rim. Please call either of our store locations to order: 636-227-CODI or 314-692-CODI.